The proposal put to Finance Minister Euclid Tsakalotos by Greece’s lenders on Friday in order to conclude the programme review would involve Athens adopting roughly 2 percent of GDP (3.6 billion euros) in new fiscal measures. The bulk would come from a reduction to the tax-free threshold for personal incomes, which currently stands at 8,636 euros, and the rest from a cut to spending on existing pensions. This is a tall order for the Greek coalition. Even if one sets aside its premature and somewhat naïve insistence over recent weeks that no new measures would be needed to conclude the review, the lenders are still demanding a great deal from Tsipras and his ministers. This government has already passed close to 5 percent of GDP in austerity measures since it came to power and the bailout agreement signed by Tsipras after so much agonising in the summer of 2015 makes no mention of the need to agree on any measures for the period after 2018, when the third programme expires. 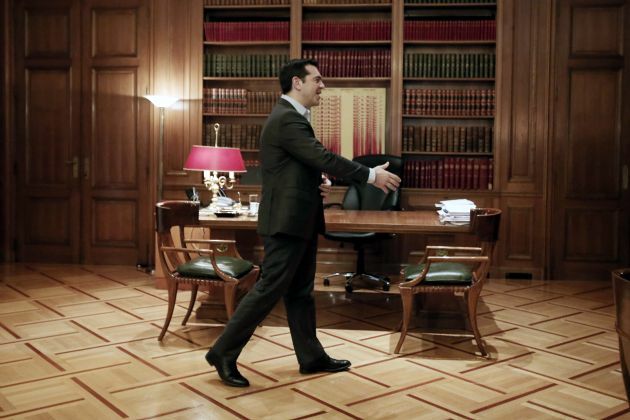 The Greek prime minister is, quite literally, being asked to go above and beyond to conclude the current review. In these circumstances, and with his party faring poorly in the opining polls (a poll of polls published by Kathimerini on Sunday showed SYRIZA garnering 18.3 percent against 29.9 for the leading party, New Democracy), the appetite within SYRIZA for another capitulation in the face of pressure from the country’s creditors is low. The leftists’ fear is that if they agree to another 2 percent of GDP in fiscal measures, it will exacerbate their unpopularity and - even if they hang on for another year or two - they will not be able to rid themselves of the stigma and will “do a PASOK” at the next elections, plunging into single digits and becoming irrelevant in political terms. This is why some members of the government are advising Tsipras to throw in the towel now and go to snap elections. If he does so without having agree to further measures and blaming the impasse on the lenders, it might push SYRIZA’s ratings up a few percentage points, regaining some of the 4.4 percentage points that it lost during the course of 2016, according to the poll of polls. An early trip to the ballot box would have the added benefit, as far as SYRIZA is concerned, of passing the ticking timebomb over to New Democracy and its leader Kyriakos Mitsotakis. Given the situation they would inherit, it remains a mystery why the conservatives have been suing for snap elections on almost a daily basis for the past few months. The belief that they might be offered significantly better terms by the institutions because of a more market-friendly and reform-oriented approach seems pure fantasy. The lenders may be able to communicate on the same wavelength with Mitsotakis but they have a mistrust of the Greek political system as a whole. They have also adopted the International Monetary Fund’s belief that Greece needs the pension and tax reforms that were requested last Friday regardless of future fiscal targets. These are measures that there is no escaping from unless the IMF leaves and the current programme is torn up. However, in the absence of the Fund, which the eurozone’s hardliners trust as an enforcer, any European programme for Greece is likely to overcompensate on toughness. Either that or there simply will not be enough political support in member states for a new programme, leaving Grexit as an inevitability. If Tsipras does not choose a quick exit, his two other options are to either conclude an agreement with the lenders or to keep negotiating until Greece runs out of money. Some government and SYRIZA members have undoubtedly been encouraged by the rise of the SPD in German opinion polls ahead of the September elections in the eurozone’s paymaster. They may be holding out hope for a political sea change in Germany that could lead to Berlin adopting a stance that is more friendly towards Greece. At the very least, Finance Minister Wolfgang Schaeuble’s days in government may be numbered if the social democrats mount a serious challenge to Chancellor Angela Merkel and her CDU party. From SYRIZA’s perspective, another positive development that could occur in the coming months is President Donald Trump using the influence the US has within the IMF to force the Fund to drop out of the Greek programme. Some in the leftist party seem to believe that with the IMF out of the picture, things will become much simpler. They feel the demands for more fiscal measures will disappear and it will be much simpler for the review to move towards its conclusion. This seems to be wishful thinking for several reasons. As mentioned earlier, it is quite likely that the Europeans will make the programme terms tougher to compensate for the IMF’s absence. If they are able to get to the point of approving a new bailout, that is. If the Fund drops out the pressure on the eurozone for debt relief will also vanish. Finally, Greece needs money by July, which leaves little time for a new programme to be agreed if the current one is cast aside. A programme-less Greece with close to 8 billion euros of debt and interest repayments to cover in July sounds like a Grexit horror show waiting to happen. It is also worth noting that German elections are two months after this so there will no change in approach from Berlin before then. Tsipras’s final option is to find a way to reach an agreement with the institutions, conclude the review, ride out the domestic political storm and hope that returning growth and debt relief in 2018 are enough to revive his party’s fortunes and secure his own legacy. However, for Tsipras to agree to the lenders’ demands there will have to be some concessions. The Greek side believes that the volume of measures being demanded is too high. It points to the primary surplus target being beaten by 1.5 percentage points in 2016 (an assessment that the European Commission concurred with in its Winter Forecasts published on Monday) as evidence that any demands for more fiscal measures should be tempered. If there is some willingness on the lenders’ side to reduce the 3.6-billion-euro total, this could form one element of a compromise. The other aspect that needs clarification is the fiscal targets for the coming years. Athens is hoping that it will not have to maintain a 3.5 percent of GDP primary surplus for more than three years, which is substantially less than the 10 years Berlin had proposed recently. Should the institutions show flexibility on this issue as well, it would be another significant gain for the Greek side. The most vital concession, though, is on debt relief. The Greek government has made it very clear that it does not want to agree to anything that fails to secure access to the European Central Bank’s QE programme. For this to happen, the eurozone creditors are going to have to provide more clarity on what medium-term debt relief measures they are prepared to consider. Speaking to a committee in Greek Parliament on Monday, Bank of Greece governor Yannis Stournaras said that a legally-binding commitment to implement further debt relief is needed from the Eurogroup or the European Stability Mechanism for the ECB to consider Greek debt sustainable and, therefore, Greek government bonds eligible for QE. This creates a potential sequencing problem though, as Berlin wants to see Athens adopt the measures first before it enters into any binding discussion about debt relief. However, it is doubtful if Tsipras’s hard-pressed MPs will consider a non-binding verbal pledge from the lenders to adopt further debt relief enough of a sweetener for the bitter pill they have to swallow. If this obstacle can be overcome, then there is no reason why Greece and the institutions should not come to a compromise that will lead to the conclusion of the review. There are hard choices to be made all around.